BlackBerry Z3 shown in the wild | BlackBerry Blast! BlackBerry announced the upcoming BB Z3 at the end of February. The Z3 is another full touchscreen phone by BlackBerry that will focus on the low end of the smartphone market. We haven't seen many photos of the Z3 until now. 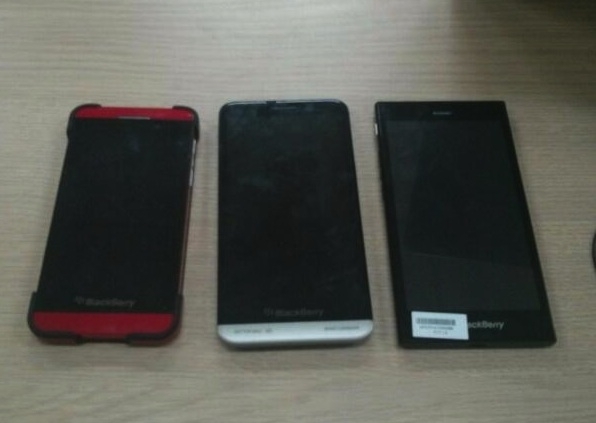 GengBBM has posted a photo of the Z3 along side the BB Z30 and Z10. The BlackBerry Z3 is shown all the way to the right in the photo above. The photo is a bit blurry, but that's all we get for now. The BlackBerry Z3 is a BB10 full touchscreen phone that sports a 5 inch display. It's a 3G phone so it will definitely target the low end of the market. The Z3 will be launched in Indonesia, but will also be available in other countries as well with a LTE version expected to hit North America.